1Password for iPhone and iPad is a password management app that lets you generate, store, and fill strong, unique passwords for all your web logins. What's more, 1Password will also store and fill your credit and debit card information, backup all your software licenses, and lock down any secure notes you want to keep. While Apple includes the free iCloud Keychain service in both iOS and OS X, it doesn't include the "master password" feature of 1Password. With a master password you can, for example, hand your iPhone or iPad to a friend, family member, or colleague without having to worry about them accessing your passwords and card information. Sync options include both iCloud and Dropbox. 1Password also has versions for Mac, for Windows, and for Android, so you can use multiple platforms and maintain access to all your data. Prefer using 1Password for all of your password needs? Here's how to make it your default password Autofill provider. 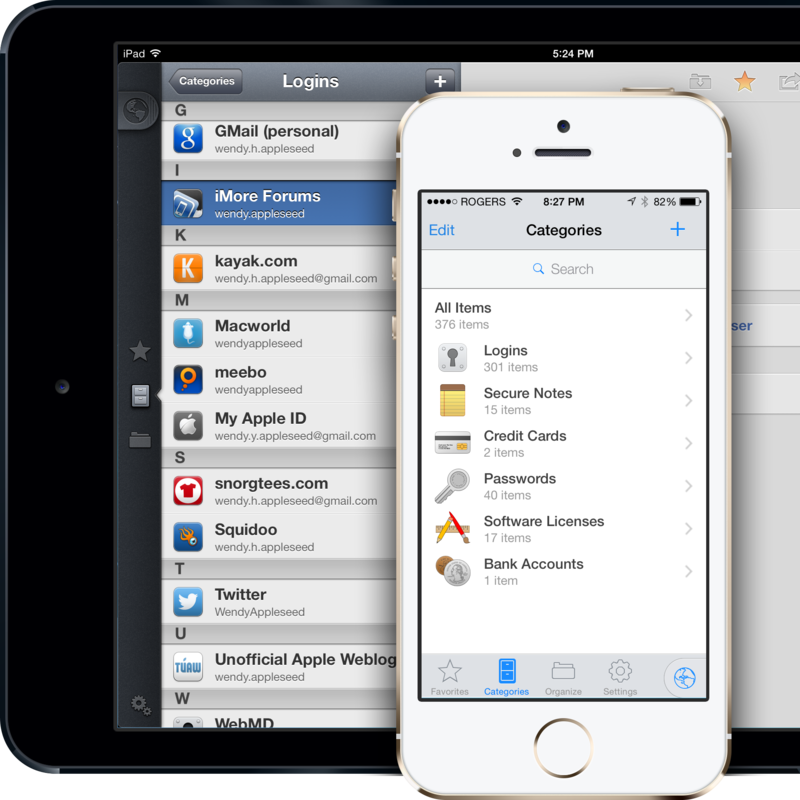 Popular password manager 1Password recently received an update, bringing a handful of bug fixes and new features. 1Password 7 for Mac is here and it's jam-packed with new features! AgileBits just launched the latest version of 1Password for Mac and it's filled to the brim with new features, including new organization options, Watchtower improvements, a new design, and an overhaul of 1Password Mini. AgileBits just launched an iteration of their famous password manager specifically for businesses, featuring compliance controls, three-factor authentication, and more. Widely-used password manager 1Password just got an update, and it's more full-featured than ever. 1Password has already integrated with the new Pwned Passwords tool to let you check for compromised passwords. Here’s how you use it. Michael Fey and Matt Davey of 1Password for iPhone and iPad talk password management as a service, Face ID, and security when crossing borders. 1Password, the well-known password manager app for macOS, iOS, Windows, and Android, garnered some negative attention over the last week. Here's what's really going on. 1Password on the Touch ID MacBook Pro? Sign me up! AgileBits, the company behind the password management software 1Password, showed off some upcoming functionality for the Touch ID-enabled MacBook Pros. I'm sold. AgileBits has officially launched 1Password for Teams, offering businesses an easy way to manage and create shared passwords. Have all your logins in LastPass but want to move over to 1Password? Here's how! Evernote has added 1Password integration to its iOS app in order to encourage people to use stronger passwords.